A city on the East Coast of the USA which calls itself the "city of brotherly love" (after the literal translation of the Greek roots in its name) and was the cradle of US independence. For the dark tourist, however, it is rather two more unusual sites that warrant a trip to this pleasant old city, one a world-renowned medical exhibition, the other a grim former prison. Apart from these two extraordinary highlights, there are a couple of monuments that may be less significant but are perhaps worth a quick look when in good old Philly. 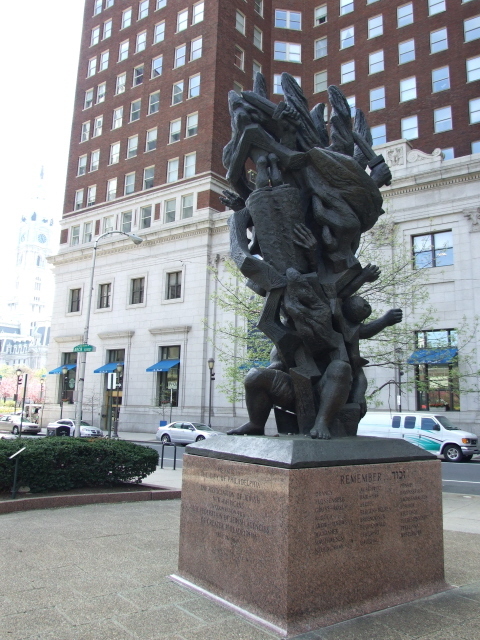 Like so many places across the USA, Philadelphia also has its Holocaust monument. 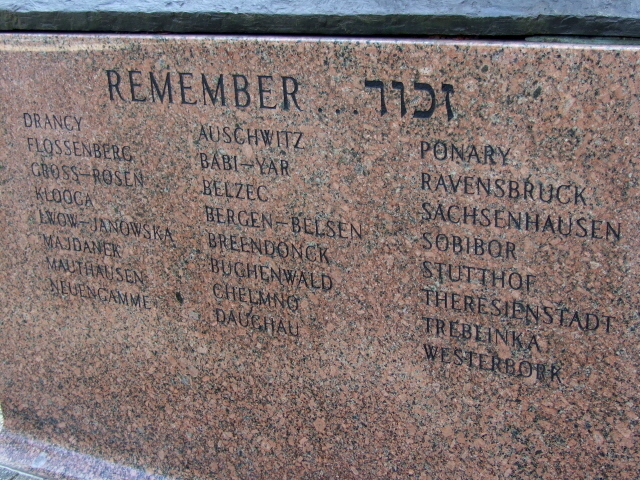 It's of a rather modest size and not particularly rousing design so that it wouldn't be particularly noteworthy – if it wasn't for the fact that some of names of places of the Holocaust engraved on one side of the memorial contain a few rather embarrassing spelling errors. The fact that Flossenbürg is misspelled "Flossenberg" is perhaps halfway understandable (though still not really forgivable) given that in an English pronunciation both spellings would sound the same. But the fact that the name Dachau is misspelled as "Dauchau" is really a hair-raising, whopping blunder, all the more so given that Dachau is – especially from an American perspective! – the best-known and most visited of the former Nazi concentration camps. Still they got the spelling wrong – quite how this could have happened is a mystery to me. 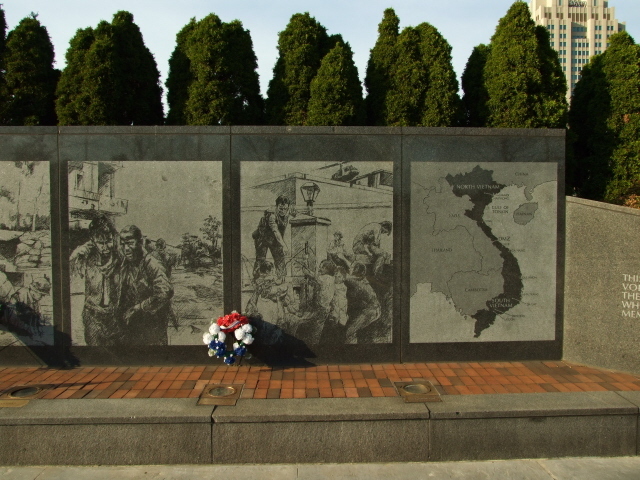 Philadelphia also has its own Vietnam veterans memorial. Compared to the much more famous counterpart in Washington D.C., the Philly one is decidedly more kitschy in its execution, more "graphic" (stone slabs with photo-like images, maps etc.) and obviously tries to convey a palpably more "patriotic" message. 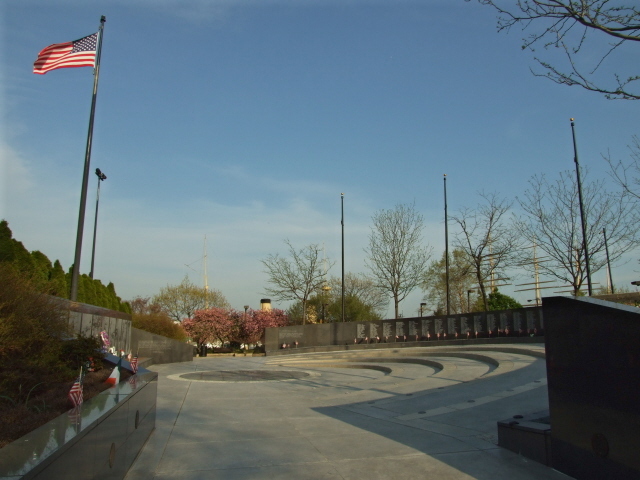 Near the Vietnam vets monument is Philly's pleasant waterfront with a maritime museum (called "Independence Seaport Museum") which includes two museum vessels. 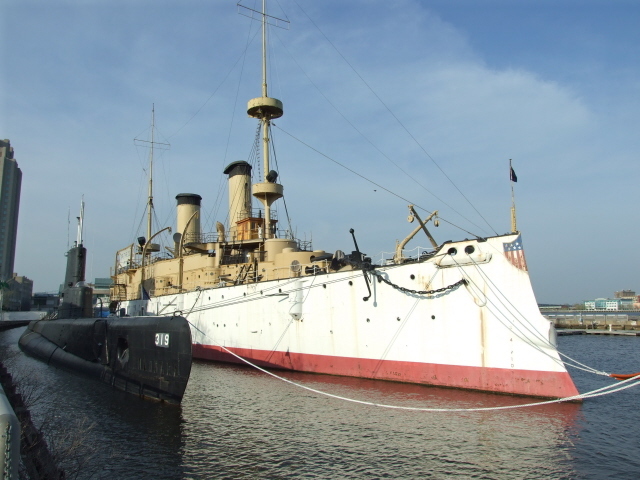 One is a large black WWII submarine, the other the 19th century cruiser "USS Olympia", which was the US flagship in the battle of Manila Bay, the Philippines, at the onset of the Spanish-American War in 1898 and is apparently the world's oldest steel ship still afloat. A rather peculiar, and in its own way dark sight to behold can be found at the Rodin Museum just north of the Ben Franklin Parkway – and you can see it without actually going into the museum. It's on the south portal and looks like a huge door, but is a richly sculpted bronze relief affair, i.e. a piece of art in itself, and a significant one at that. But I can't go into all the relevant art history here. What's important here is that it's dark insofar as it is called the "Gates of Hell" and that's what it depicts. It's basically a intricately crafted scene of writhing bodies of the damned being thrown into hell. That's certainly dark. 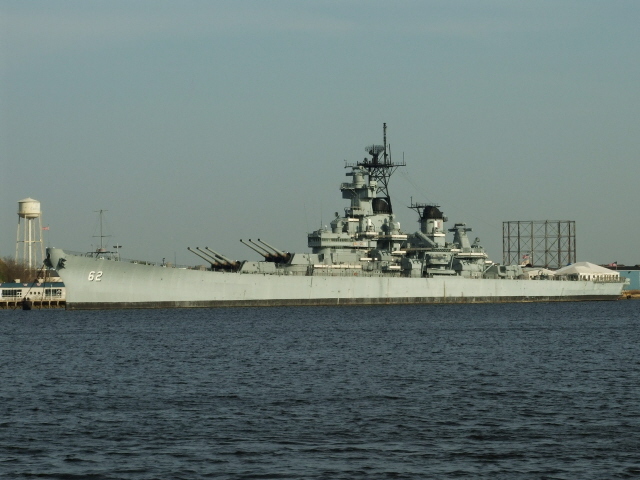 Not strictly speaking in Philadelphia, but only just across the Delaware River on the New Jersey side is moored the USS New Jersey, one of the last (and biggest) battle ships the US Navy ever had. It had been in service on and off for ca. 50 years since 1943, taking part in various conflicts, not just in WWII (when it played an important role in the invasion of Okinawa), but also both the Korean War and the Vietnam War. During the Cold War in the 1980s she was even upgraded as a missile launch ship. It is now a museum ship (open daily 9:30 a.m. to 3 p.m.) and is possibly of interest to the more war-tourism-inclined visitor or to those with special maritime interests (in summer, there's even a boat shuttle taking visitors across the river) – other dark tourists can probably make do with just a view of the massive grey vessel from Philly's waterfront and save the hefty nearly 20 USD admission fee (plus boat fare). Location: on the Delaware River, near its estuary, in eastern Pennsylvania, USA , about halfway between New York City to the north and Washington D.C. to the south. Access and costs: easy to get to and not as expensive as some other East Coast cities. Details: Philadelphia is conveniently located between the two major cities on America's East Coast, namely New York and the capital, Washington D.C.. It thus benefits from the transportation links between those two places and can easily be reached by all means of transport including fast trains (rare these days in the US), though buses and even planes are cheaper. Booked early, the bus fares can in fact be ridiculously dirt cheap (my wife and I paid a mere 5 USD from Washington by Greyhound bus). Getting around within Philly is also easy – and as most of what will be relevant to the visitor is central enough to be walkable it can even be absolutely free. Otherwise there are buses and an efficient metro system. Accommodation doesn't have to be as expensive as it tends to be in esp. New York. We paid a little over 100 USD for a standard major chain hotel room. Try that in NYC! Living costs for the visitor can be tailored – I ended up paying a lot overall – but that's mainly because I wanted to sample the delights of some irresistible high-class ethnic restaurants (see below). Time required: for the dark elements you wouldn't necessarily need more than a (full) day – but the city is worth taking in for a couple days more … really! Combinations with other dark destinations: Given the location between New York and Washington D.C. either or both of these cities make for a perfect combination with a stopover in Philadelphia – by any means of transportation as well. And if you're driving, places in the rest of Pennsylvania (see Centralia and Harrisburg) are in relatively easy reach too. Further afield see under USA in general. Combinations with non-dark destinations: For some reason, Philadelphia seems to have a somewhat unfavourable reputation, but I really cannot see why that should be so (maybe it was more boring in the past?). I found it a fabulous place, with a superb mix of big-city-ness and relaxed neighbourhoods, a lovely maritime whiff of the sea by the river, plenty of history (by American standards) and not least an interesting gastronomic scene of the very highest order. Honestly. I loved Philly! 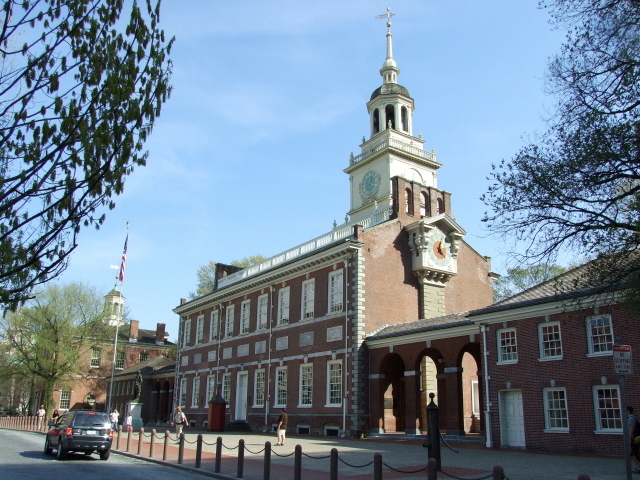 Most visitors come to Philadelphia for its historic sights, especially those connected with US independence. Philadelphia is one of the oldest cities and for a long time the largest in America (now the fifth largest city in the US). Moreover, it was here that the declaration of independence was proclaimed, and the city was even the national capital for a brief period (after New York and before Washington). The famous Liberty Bell can be seen here and is indeed one the prime tourist draws, together with Independence Hall and other historic buildings (which, by American standards, actually are fairly old) and the Constitution Center. Other mainstream tourist attractions include the massive Museum of Art as well as various smaller art centres. Philadelphia is also home to the USA's oldest zoo. And Fairmount Park is considered the biggest park in the US … although strictly speaking it isn't a single park, since it is dissected by the Schuylkill River, the smaller of the two Philly rivers – the other one is of course the Delaware River. This provides for a pleasant waterfront from where you can gaze across to New Jersey. The view is best from Penn's Landing south of the Ben Franklin Bridge stretching down past the Seaport Museum and the four-masted tall ship "Moshulu" (now a pricey and classy floating restaurant), which originally came from – I just have to stress this bit – Hamburg (my original home town). It makes for an almost maritime atmosphere – which is something I personally like (having been brought up by, and partly on, the sea). I even spotted the shape of the classic ocean liner "United States" in a dock in the distance – it's still the record holder for transatlantic crossings (of "Blue Ribbon" fame) … but is unfortunately unlikely to be preserved. Back inland, there are many pleasant rows of pretty townhouses and smaller squares with greenery ringing the higher-built centre, where a few older as well as modern skyscrapers complement the low-rise architecture. It's not New York, of course, but a couple of the gleaming tall towers are fairly appealing to the eye. Downtown Philly is small enough to be walkable for anyone who is reasonably mobile, so just strolling about between the waterfront to the east and University City across the Schuylkill to the west can be rewarding. 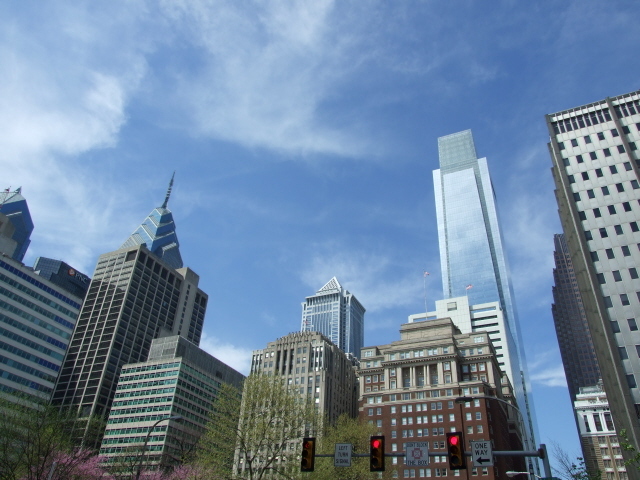 The centre-point (other than historic Independence park) is formed by Philadelphia's City Hall, a massive masonry pile with a famously tall statue of the city's founder William Penn on top of its central clock tower. Philadelphia has also long been known as a centre of culinary delights (allegedly the well-known cream cheese of the same name was indeed named after the city because of its reputation for good food – though it wasn't invented or made there). And indeed, you can have some outstanding food & drink experiences in the city. I had several memorable meals in Philly – with the one at Alma de Cuba standing out most (although the modern fusion Peruvian tapas at Chifa were also superb). Lovers of good beer can find an outstanding range in some (mostly) Belgian bars ("Eulogy" on Chestnut Street near the waterfront has the widest range – and good moules and frites too!). These are just a few examples – the restaurant scene in Philly offers much, much more, well worth exploring for several days at least. Reading Terminal Market, finally, is not just a splendid outlet for all manner of food stuffs (including some Amish vendors) but also a superb place for a quick lunch at one of the high-quality snack bars (I had a yummy Cajun lunch there).